St. Bernward was born in 960, from a Saxon noble family and studied at the Cathedral school at Hildesheim, and grew up to be the Bishop of Hildesheim. He served as a scribe and chronicler at the court of Otto II. He and the future Pope Sylvester II were in charge of the young Emperor Otto III. Hildesheim was the center of power in the Holy Roman Empire in his time, and he was determined to give his city an image fitting for their power. He revived a classical precedent, by having his name stamped on roof tiles made under his direction. One of the most famous examples of this ambition is a set of cast bronze doors known as the Bernward doors, now installed at St. Mary’s Cathedral. They were sculpted with scenes of the “Fall of Man” – Adam and Eve, and the “Salvation of Man” – Life of Christ. Another importance of Bernward’s intentions is the pillar kept at the Cathedral of Hildesheim, a cast bronze column with images of the deeds of Christ. St. Bernward was instrumental in early Romanesque construction. A famous one is St. Michael’s Church, and it was completed after his death. He is buried in the western crypt. The projects of St. Bernward’s are listed today on the UNESCO World Heritage Sites. He built up the Cathedral district with a strong twelve-towered wall and erected further forts in the countryside to protect against attacks by the neighboring Slavic peoples. Beyond this effort of his, inner spiritual struggles of his diocese and aiding the poor were always closest to his heart. He died on November 20, 1022, a few weeks after the consecration of the magnificent Church of St. Michael, which he had built. Pope Celestine III canonized him. St. Bernward’s Church in Hildesheim and St. Bernward’s Chapel in Klein Dungen, which dates from the 13th Century, are named after him. 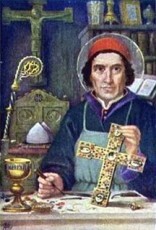 St. Bernward was a Bishop in Hildesheim, and was famous for his work in the early Romanesque construction of our Church. He worked hard to build up the Cathedrals and Church architect, many of which can be seen today. Some of his work from the 13th century can be seen today at the St. Bernward’s Chapel in Klein Dungen. Although he is known for this great work, his heart was poured into spirituality and aiding the poor of his diocese.